Never a common name was so guessed and so shared by anyone who observes it for the first time! As soon as you see it is instinctively you say …but this small bird has the throat slit, is it wounded? That the nature indulges itself giving the livery of the birds extravagantly and prima facie senseless colours, may at times marvel, even if, studying in deep the motivations, a logical and appropriate justification is always found. In most cases the livery serves to birds, in particular in the males, for conquering the partner or for camouflaging with the surrounding nature but to this bird does not serve surely for this last reason and perhaps only minimally for the first. However, we leave free interpretation to any single observer. The Cut throat (Amadina fasciata Gmelin, 1789) belongs to the order of the Passeriformes and is ascribed to the family of the Estrildidae, a particular group that gathers all those multicoloured small birds so much loved by the amateurish breeders thanks to its docility, the prolificacy and the facility of detention in captivity. 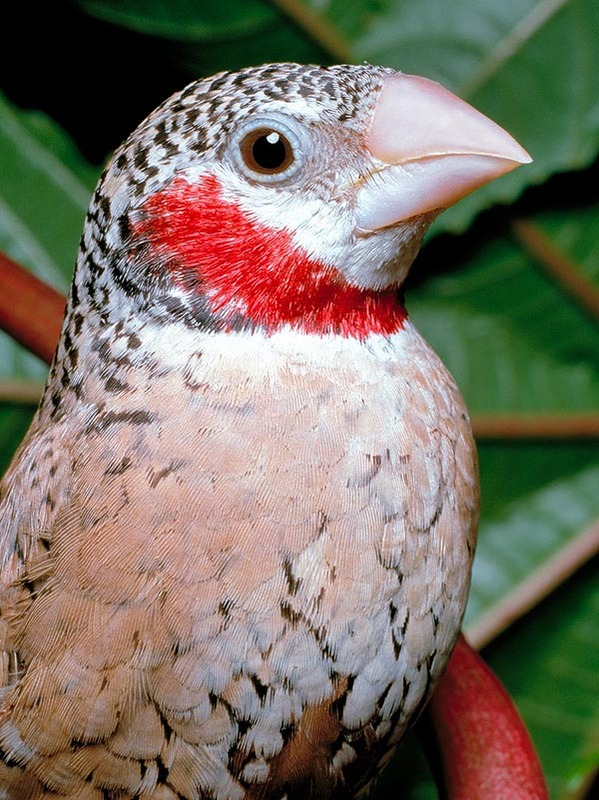 It is also long-lived and very resistant besides being little noisy if compared to the famous red avadavat (Amandava amandava). There is no breeding that does not see the presence of these pretty small birds that are often used for the creation of new varieties and mutations, with increasingly disordered colours and more and more daring and complex crossings. Are already present on the market specimens totally albino or pastel, others yellow or isabella and others brown or with silvery colours, fanciful liveries and quite different from the original and obtained purely for ornamental and commercial purposes. Almost all European common names recall its particular livery. In Italian it is called Gola tagliata, in German, Bandamandine, in Spanish Estrilda Degollada, in French Amandine cou-coupé and in Portuguese Degolado. 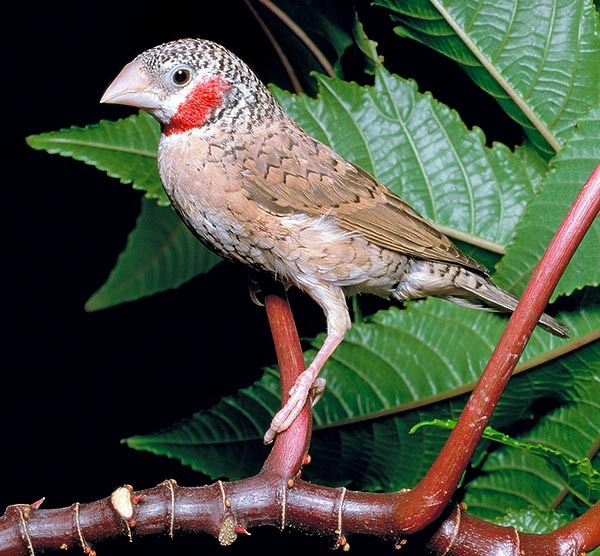 The etymology of the genus Amadina gets origin from a wrong diminutive form of the genus Ammodramus from the Greek “ammos” = sand and “dromos” = runner that generically identified a sparrow. Swainson in 1827 thought in fact that the genus Amadina was a connecting link between the genus Ammodramus and Estrilda. 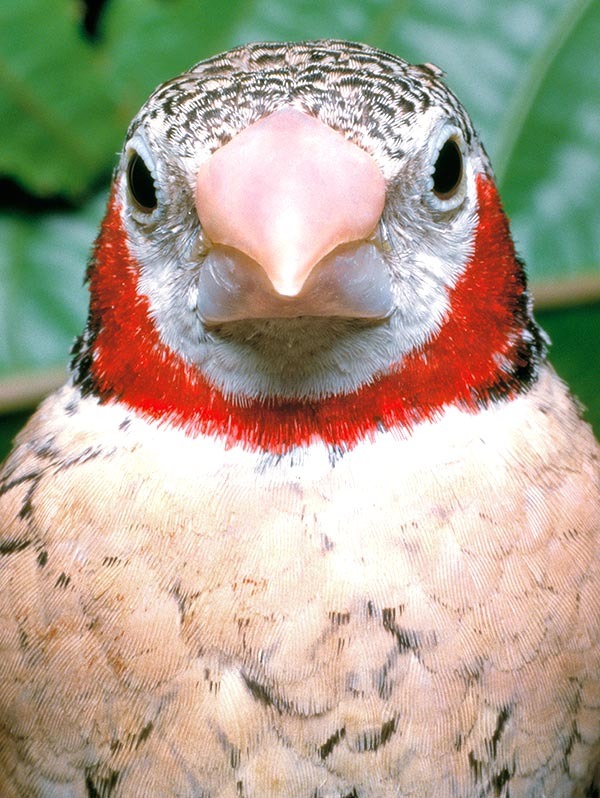 The name of the species fasciata comes from the eponymous Latin term and is clearly referred to the blood red band it has under the throat. 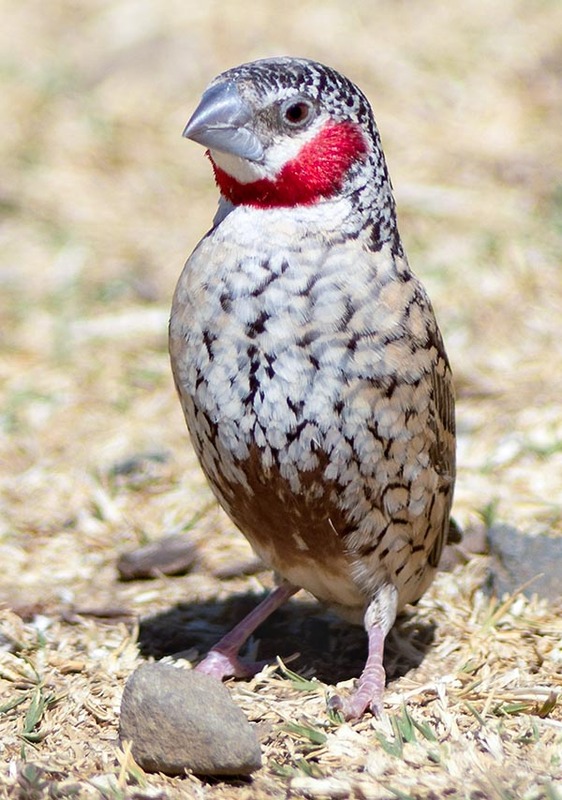 The cut throat is a typically African bird living in the sub-Saharan steppe area from Senegal to Ethiopia and from the Horn of Africa south up to Eastern South Africa. It is absent in all the western part of the continent and in the extreme south. As it loves the arid and grassy zones, it is totally missing from the equatorial forests and from the heavily wooded forests. It is a sedentary bird and the few and short movements to which is seasonally subject, reduce to post reproductive wanderings towards areas rich of food and in the period of the rains. It is nowadays a species detained in the whole world for the amateurish purposes we were hinting previously, therefore possible finds in the wild state are only fruit of more or less accidental escapes from breedings. Of course in such a vast range including territories placed at different latitudes, some subspecies have evidenced distinguished by a different colour of the livery but also by a variation in the size of the individuals. Amadina fasciata fasciata that is the nominal species diffused in the narrow sub-Saharan band going from the Atlantic to the Rift Valley, Amadina fasciata alexanderi typical of the Horn of Africa and south up to the Lake Tanganyika, Amadina fasciata contigua from Tanzania up to the extreme south of the range and Amadina fasciata meridionalis present in Angola and Zambia. The classification of other subspecies is still matter of discussion. The cut throat lives in the savannahs and the grassy plains with little vegetation formed by isolated acacias or by high spiny shrubs. It does not love the heavily wooded zones, forests and humid or swampy environments but does accept the shrubby zones close to water surfaces, from which it depends, with even soil with sand and laterite. It has no fear for the human being and approaches without any difficulty villages and cultivated zones where the food is abundant and where forms, during the post-nuptial period, flocks at times of thousands of specimens that wander hither and thither in the country looking for food and water. 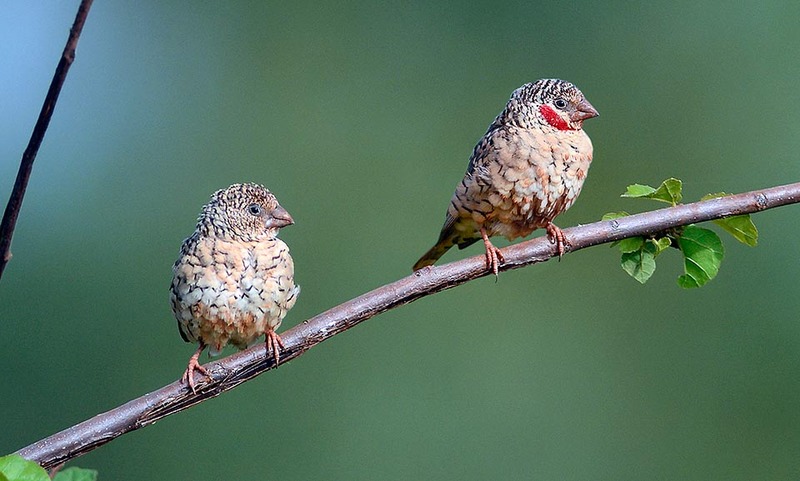 Although very social outside the nesting period, this small bird becomes extremely territorial and defends strongly its own territory when has formed the couple. 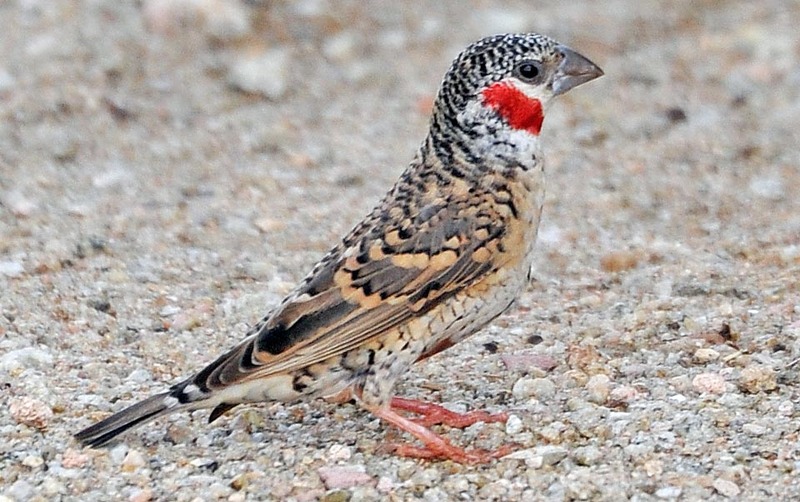 However, its sociality is monospecific and only occasionally it can be seen mixed with the congener Read-headed finch (Amadina erythrocephala) even if their territories touch marginally, with the ubiquitous Red-billed quelea (Quelea quelea) or with the African silverbill (Euodice cantans) or other passeriforms. This small bird has a very reduced size and has a so much fast and darting flight that it is often difficult to follow. It does not surpass the 12 cm of length, 15 cm of wingspan and the weight does barely exceed the 10 g.
It is a very mobile small bird and is continuously moving when on the ground looking for food, where it totters and jumps incessantly as well as when perched on a branch where it shows a natural hysterical agitation but that actually does not reflect its docile and meek character. Conversely, it is quiet and calm when perches on a small branch together with the partner and begins grooming and rubbing each other tenderly. The livery of the male is very similar to the female’s one but he is the only one having the blood red gag going from one ear to the other passing exactly on the throat, as if it were a wide bloody wound. The basic plumage is hazel yellowish, more marked on the alar cover and paler on the chest and on the lower part of the body where it becomes brown. The abdomen is often marked by a thick white and black marking that creates a net detachment with the upper part of the chest. The head and the shoulders have a thick black dotting more marked on the head and sparser on the shoulders and the rump, to finally disappear on the tail that gets back evenly hazel cream. The bill is pearly grey, strong, short and conical, the eyes are black and the legs have a light flesh colour. The female, besides missing of the “cut throat” is much more marbled and uniformly spotted of blackish. The young closely resemble to the female even if the little young males almost immediately after the birth do have the first signs of the red belt on the throat. Anyway, the livery is not uniform in all specimens and often shows a considerable variability in the single individuals. There is not a precise period for the nesting though usually this occurs during the rainy period and preferably towards the end, moment when all graminaceous plants produce their seeds. The nest of the cut throat is placed in a fissure or in a hole of a tree, often taking advantage from a shelter already previously occupied by other species that is filled up randomly with soft vegetal material to form a shapeless globe with a small molded niche inside. Usually, are laid 4-6 white eggs and the brooding is done by both parents which alternate during the day but even unite in the night. The eggs open after about 14 days and the small nestlings just after the birth are blind and bare but grow up quickly and after three more weeks of parental cares by both parents are ready for their first flight. However, they keep close to the family for some time more, forming those flocks we were previosly talking of. The maturity occurs when one year old. They make one or more broods per year depending on the food availability. The feeding of the cut throat is based on a massive consumption of graminaceous but also of berries, fruits and buds, of insects, larvae and invertebrates, particularly during the nesting time as it is the essential food for the growth of the nestlings. It is not considered as an endangered species.